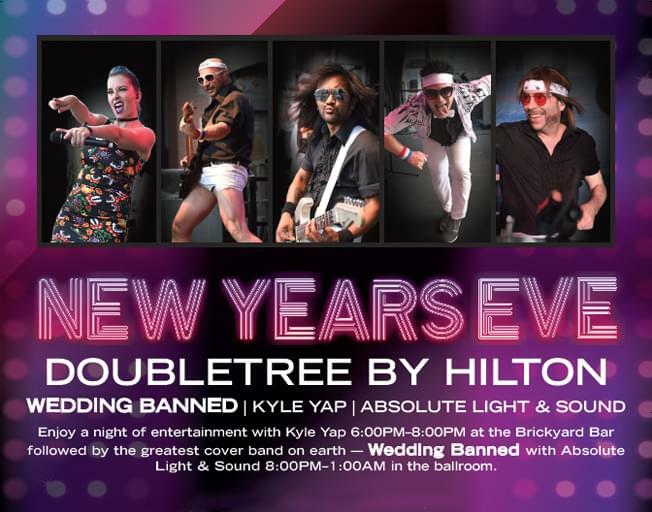 Join WJEZ for a New Year’s Eve to remember at The DoubleTree By Hilton, Featuring Wedding Banned! With a full bill featuring Kyle Yap and Absolute Light & Sound as well, you can’t miss this great show! Individual Event Tickets and Overnight Packages are available now! Don’t miss out, make your reservations today! Includes: Five Drink Tickets, hors d’oeuvres, champagne toast. Includes: Two event tickets with VIP show access starting at 7:30PM, 10 drink tickets, hors d’oeurves, champagne toast, overnight stay for two guests with breakfast included the following morning.